With spring just around the corner, pastel colors are beginning to appear in fashion magazines as well as in nature. Soft blue, pink, and purple handbags and nail colors take center stage. If you’re ready to replace winter’s dark hues, then a watercolor manicure is a good place to start. This technique is a little different because it uses watercolor paint instead of colored polish. To achieve pleasing results, it’s important to use matte no-wipe gel underneath the paint. It provides a better canvas for the watercolor. Once the paint is dry, apply the top coat to restore the shine and protect your beautiful manicure for weeks. 2. Apply one coat of matte no-wipe gel to the nails, then cure them with the lamp. 3. Dip the fine detail brush into the cup of water, then wipe it onto the paper towel to remove excess moisture. 4. 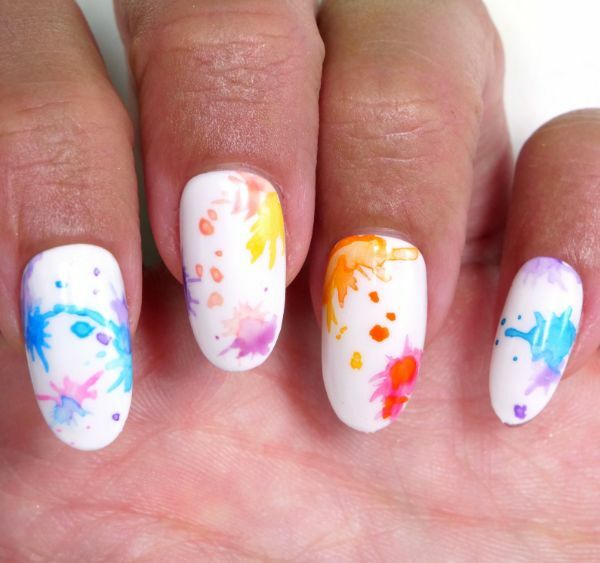 Sweep the brush over the blue watercolor paint, then apply the paint to the nail, making a starburst design and a few dots. Tip: If you want the color to be less saturated, wipe the brush gently onto the paper towel, then drag the brush through the painted section once more. 5. Wipe the excess color on the paper towel before changing colors. 6. 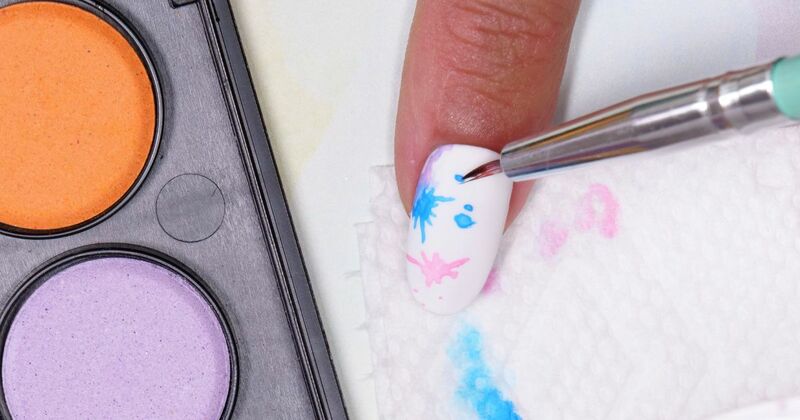 Wet the brush, and repeat steps 3 and 4 to add pink and purple designs. Let the paint dry. 7. Apply one coat of no-wipe gel top coat to the nails, then cure them with the lamp once again.